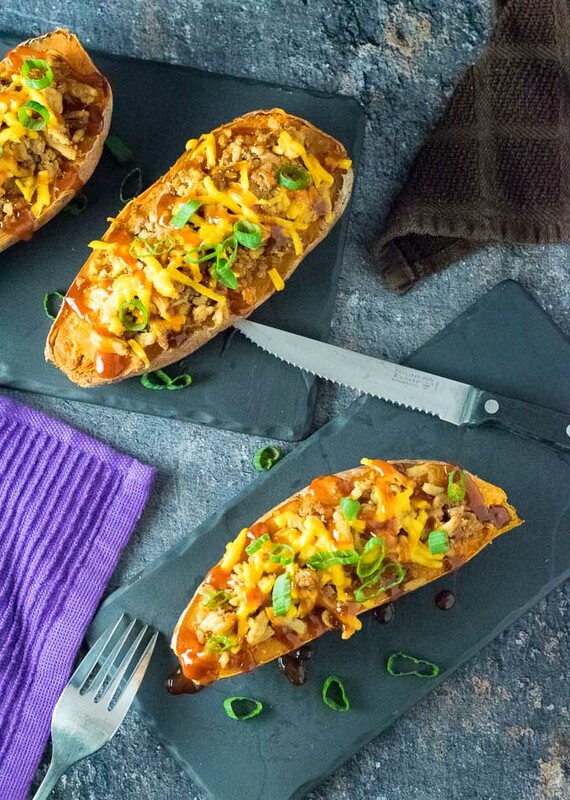 Ground turkey boldly seasoned with a BBQ dry rub, resting on top of tender sweet potatoes, are topped with melted smoked cheddar and drizzled with BBQ sauce. 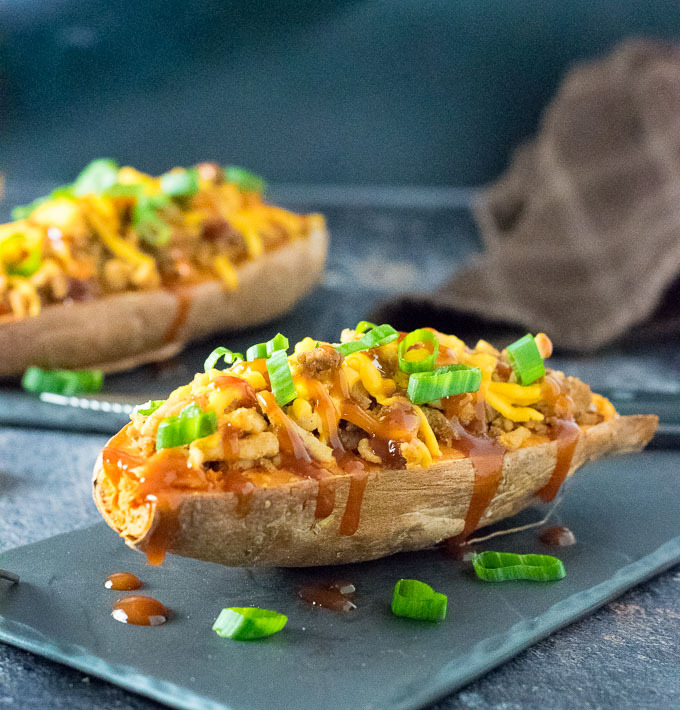 Enjoy these BBQ Turkey Loaded Sweet Potatoes for a healthy family dinner without skimping on flavor! Once upon a time, as a small child, I was routinely fed these horrific ground turkey patties slathered in a gut-wrenching cream of death sauce. A recipe I was certain Satan himself devised to lead me into a pit of sin as I screamed and schemed in order to avoid putting one more putrid forkful into my mouth. Needless to say, ground turkey recipes weren’t high on my shopping list as an adult. So if you see me publishing a recipe feature ground turkey, such as this one, you best believe it passed a ridiculously high flavor standard. 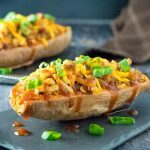 The secret to these BBQ Turkey Loaded Sweet Potatoes is boldly infusing the ground turkey with BBQ seasonings. It really amps up the barbeque flavor, while drizzling the final dish with my homemade BBQ sauce is a great final touch. The seasonings used for this recipe were inspired by my BBQ Dry Rub recipe. Additionally, ingredients such as smoked paprika, liquid smoke, and smoked cheddar all combine to really ramp up the classic smoked barbeque flavors your tastebuds expect. You can certainly omit liquid smoke and use regular paprika and cheddar instead, but you will be missing a great layer of flavor in your final dish. If you want to make easy loaded sweet potatoes, you can’t go wrong making them in your microwave. Some microwaves even have a one-touch “Potato” button that works phenomenally. Otherwise, simply cooking it on high for 5-8 minutes should suffice on most other microwaves. It is done when the inside is completely tender when pierced with a fork. You also will want to pierce the sweet potatoes multiple times with a fork prior to cooking. This allows steam to escape and prevent cracking. Alternatively, if you are a purist, baking sweet potatoes is always a great option, however, it will take considerably longer. You will still want to pierce them multiple times with a fork prior to baking. Bake sweet potatoes in the oven preheated to 425 degrees for 45 – 60 minutes. Once again, they are done cooking when the interior is perfectly tender. Final baking time will vary depending on the thickness of your sweet potato. Pierce sweet potatoes with a fork multiple times on each side then cook the sweet potatoes in the microwave for 6 minutes, or until tender. They can be prepared in the oven as well if desired. Brown turkey in a non-stick skillet over medium high heat and crumble with a wooden spoon. Add all seasonings to the turkey along with 1/3 cup of water. The water will help the seasonings disperse evenly. Continue cooking until water evaporates. Sprinkle lightly with smoked cheddar cheese and place under the broiler for a couple minutes, until melted. Remove from oven, drizzle with BBQ sauce to taste and sprinkle with chopped green onions. IF YOU LIKE THIS RECIPE check out my Chorizo and Sweet Potato Hash with Eggs! 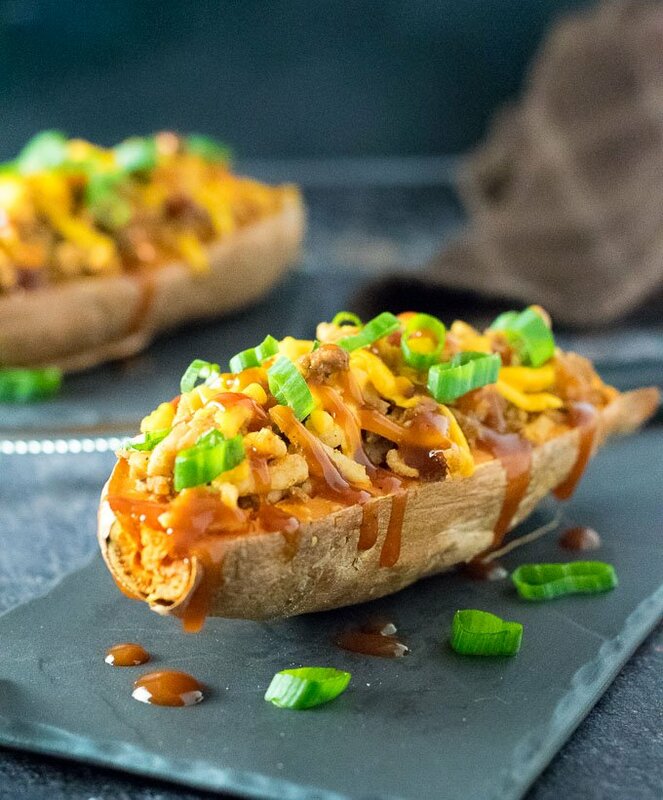 If you enjoyed reading about my BBQ Turkey Loaded Sweet Potatoes recipe then you should probably like me on Facebook and follow me on Pinterest too. That’s what I would do at least, because if you don’t get to know me but you still use my recipe it is kind of like taking candy from a stranger, and your mom taught you not to do that. Don’t disobey your mom, subscribe to Fox Valley Foodie today. If I decide to bake the sweet potatoes,at what temperature & how long do I bake them. 425 degrees for 45-60 minutes should work for most sweet potatoes.